Activity takes about two class periods plus an additional two periods for assessment if included. Computer access is necessary. Ideal for middle school students, could also be used as a brief intro to climate modeling at high school or a homework assignment. G) Drawing conclusions and developing explanations. F) Working with models and simulations. A) Processes that shape the Earth. 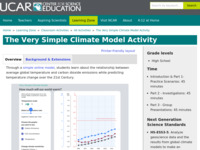 Engages students in thinking about climate models and more specifically what is provided as background for this model. Ideally, students would know something about climate models. Suggestion of how to start lesson: Review notes for the very, very simple climate model and compare to other models. Extension idea: Compare to Intergovernmental Panel of Climate Change report. Educator needs to be very careful in using this simple model in class; explain the limitations of models in general without giving students (incorrect) arguments to question the science behind climate change. Use the document in appendix about accuracy and uncertainty in climate models. Using the model with directed questions would be more effective in the real teaching setting. Ideally educator designs a worksheet with student-centered questions (especially important for middle school students). Students with low math skills might struggle and might need special guidance. Students may become confused between global climate change (i.e. warming) and the regional climate change that impacts society, which can be warming or cooling. This should be clarified. Introduces students to climate models and provides educator with opportunity to teach about the limitations and the value of climate models. It provides a good opportunity to introduce climate models and modeling in general. Good and well-written background information for students and educators provided. Doesn't do a lot in terms of helping students understand climate modeling. Arithmetic that goes into the model is not given or transparent and makes it a "black box" (the guide only says that for relation between CO2 concentration and temperature the correlation is about 3° C for each doubling of CO2 concentration, no information on the link between emissions and concentrations). Comment from expert scientist: Although the students learn that the amount of carbon dioxide in the atmosphere rises whenever emissions are greater than zero, they don’t learn about the concept of residence time of CO2 in the atmosphere. A simple climate model might not account for the slow removal of CO2 from the atmosphere; however, this should be stated up front rather than in the background information. It would be useful to include some basic background information on the concept of residence time and how this may affect the results. Well-designed lesson plan and visually appealing model and results, which allow the students to follow the scientific process (define scenarios, compare independent/dependent variables, interpret and present results). Extensions are very valuable, and it is great that there is a piece that offers solutions and doesn't leave the students hopeless. Using the model, developing scenarios, testing them, and presenting results will engage students of different learning styles. Making sense of the graph with 3 different y-axes might be a challenge to some students. MS-C3.3: Proportional relationships (e.g., speed as the ratio of distance traveled to time taken) among different types of quantities provide information about the magnitude of properties and processes. MS-P4.3: Distinguish between causal and correlational relationships in data. MS-P5.1: Use digital tools (e.g., computers) to analyze very large data sets for patterns and trends. MS-P6.1:Construct an explanation that includes qualitative or quantitative relationships between variables that predict(s) and/or describe(s) phenomena. MS-P6.2:Construct an explanation using models or representations. MS-P8.2:Integrate qualitative and/or quantitative scientific and/or technical information in written text with that contained in media and visual displays to clarify claims and findings. HS-ESS3-5:	Analyze geoscience data and the results from global climate models to make an evidence-based forecast of the current rate of global or regional climate change and associated future impacts to Earth systems. HS-P6.1:Make a quantitative and/or qualitative claim regarding the relationship between dependent and independent variables.